With so many choices, selecting the perfect gift can be tougher than standing upright in a Nor'easter. So we've taken the guesswork out of your gift-giving! Our Choice of Product Gift Certificates let you choose the amount, while your recipient selects the contents and delivery time. Three Gift Options In Each- We even include an instructional photo insert with 3 suggested dinner options. The availability of the suggested redemption options for each gift certificate may change, but no worries, our gift certificates don't expire! Therefore, should your suggested dinner option(s) not be available, we will present you with a comparable dinner option(s). 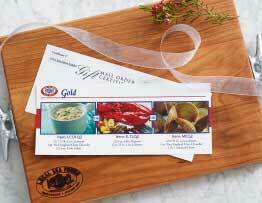 We can even assist you in applying your gift certificate towards a package of your choice.